My wife and I had a great weekend at the Indy Race this past weekend. There were races Friday and Saturday, with the Indy Lights and Indy Races on Sunday. We didn't get to the races until Saturday so we missed all the bad weather that passed through Birmingham on Friday. The park was completed in 2003 through the vision of George Barber (Barber Dairy). Rumor has it that George Barber had some initial troubles with environmentalists, who stated that the park wouldn't meet their high standards and would cause harm to the area's wildlife, and that noise from the track would be unbearable to the surrounding community. They even went as far as saying the park would be overrun with insects and wildlife. The park did finally get through the troubles and to the contrary, the park is BEAUTIFULLY done. All of the detail was carefully taken into account. From the wonderful landscaping, to the world class paddock, to the view the observing fans have with hills surrounding the track, and obviously the track, the park was built to the highest standards. He even had gigantic metal sculptures created of ants, spiders, dragons, and other insects to kind of poke fun at the environmentalists (supposedly he adds more every year). The entire park is definitely world class, and many rate it as one of the nicest race tracks in the country. This was my first time attending any kind of race and I was blown away by the whole event. It was sensory overload at first with all the events going on. My cousin, who's one the head volunteers for the event, gave us a grand tour of the park. He took us on a golf cart around the whole park and into restricted areas such as the paddock, which had millions of dollars worth of race cars and equipment. Once we got settled into our spot for the Grand-Am race we finally had a chance to sit back and soak it all in. Above: NBC Broadcast getting ready for Sunday's Indy Race. There were multiple races all weekend but the first race we got to see was the Grand-AM Rolex Series. One of the highlights of the weekend was Patrick Dempsey and his racing team. Once that race was over, we headed over to the fan zone where they had booths setup with all sorts of vendors. They had a stage right next to the autographing booths where they were interviewing some of the Firestone Indy Lights Drivers. The last race of the day was the Continental Tire Sports Car Series where again Patrick Dempsey raced in the #55 Aston Martin. At the very end of the race, dark clouds started to form and we were told to "seek shelter immediately!" so we didn't get to see the end of the race. On our last day we went to the Barber Vintage Motorsports Museum on site which houses over 1,200 vintage and modern motorcycles (largest in the country). It's also home to the largest collection of vintage Lotus Cars. It again was overwhelming and impossible to take all of it in. The Indy Race is the last event of the weekend (well usually – this year they had to reschedule a race from Friday due to rain) and the crowd was large. 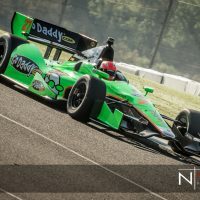 I had the pleasure of being able to get inside the track to take some shots of the IndyCars whizzing by me at 170+ Mph. There's such a difference between shooting right on the track and shooting with a tall fence between you. I used my standard go-to lenses, 15-85mm and 70-200mm and my Canon 7D. The one main difference was I used a 1.4x teleconverter (rented from BorrowLenses) – I'll post about review and experience with the teleconverter next Tech Friday. I shot in aperture priority at f5.6 (the teleconverter turned my f4 into a f5.6) and at a higher aperture (around f16 or f20) to give me that slow shutter speed (1/20 to 1/50) to get those panning shots where everything is blurred except the car (helps show the speed of the car). One thing that would have really helped out is to have a second body so I wouldn't have to keep switching between lenses. Other than that I had a wonderful weekend watching and shooting the races. I can't wait to go back next year. Too bad I can't somehow get media credentials to get those killer shots all weekend.